There is a difference between a fact and the truth. Although they may sound like the same thing, they are not synonymous. I learned many facts in school earning my degree in Social Work: if you are from a single parent household, you are ABC% to have XYZ outcome. If you have been to prison, you have ABC% risk of recidivism (going back to prison), and your children are XYZ% more likely to end up in prison as well. If you do not have a college degree, then you are ABC% more likely to have less paying jobs in your lifetime. If you are a minority from a poor neighborhood and a background of generational poverty, then you will be in poverty too. These are all facts. If you sit and look at the circumstances of your present life, they may look quite bleak. You may be in poverty, sick, having problems with your children, broke, unhappy, depressed, in a legal battle, hate your boss, hate your spouse lol…..any combination of these may be your current circumstances. Do not get caught up in circumstances, because they are just that…..circumstances; and circumstances change. Your life can be in one condition today, and a completely different condition tomorrow. Circumstances change, and facts change. Just because something is your current circumstance, or a fact, does not mean it has to be YOUR truth. Now we come to what’s important…..the truth! You determine YOUR OWN truth!!! You get to determine what you want out of life. The facts may say I am supposed to be poor, but your truth can be different, you can be prosperous. The facts may say you will end up repeating the same criminal behaviors and end up back in prison, but your truth can be a successful life. The facts may say you will be in low paying jobs for the rest of your life, but your truth can be earning your college degree later in life, and having a great career. Or, not having a college degree and starting your own thriving business. Now let me be very clear about something. Although I am a woman of faith, I also live in reality. We have to be honest with ourselves about our current circumstances. We can’t live life with our head in the sand, avoiding life and living in fantasy land. If your current circumstance is that you are in poverty, or in a negative cycle, or your health is not well, or you are stuck in a job that you hate, or whatever the case may be…..be honest about that. Then be honest about the facts. If I do not change this situation, this will be my outcome. Oh yes, those facts are real! If you do not take control of your life, the world has an outcome planned for you and your family. But what I am telling you all today is that you can change your circumstances, and determine a different path for yourself. You do not have to accept the pre-determined outcome that the world, your family, your enemies have planned for you. Where are you right now? – Take an honest survey of your life. As stated above, you can’t live in fantasy land. The first step in changing your circumstances is to acknowledge it. That is one of the reasons people abuse substances, to avoid reality. They stay high all of the time, so they do not have to face their life. Except when the high is gone, they are still in the same circumstance, or probably worse because of the substance abuse. Take some quiet time, cut off the TV and the radio, put down the phone, get alone with no one but you and God and face your life for what it is. ACTION – The last step is action! If you want something different, you have to do something different. This is where the rubber hits the road. Once you acknowledge your current circumstance, determine your truth, go to God for guidance, then you have to get to work. This step is different for everyone. You may go back to school, find a new job, start an exciting career, get into a new relationship, get out of an old relationship, start a business, buy a house, and so on. Basically, this is where you have to DO SOMETHING! Just wanting it is not enough, you have to do something to change your circumstances, and to get the life that you want! 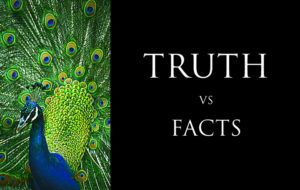 I hope that I have helped you all see the difference between facts and the truth. For those whose facts do not align up to their desired truth, I hope that I provided you with guidance to change the facts and circumstances in your life and get to your truth. If I have done that, then I am living my truth. You are living your truth, young lady! !